Through advance search algorithms, the Outlook enables searching for a particular content in an instant manner. You don't have to go through all the elements present in the folder to search for a particular item. Instead, you can directly search for the specified component within a folder by providing related keywords. 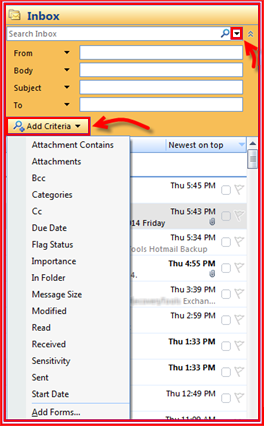 To find out a particular email or any other components from a specified folder, following steps can be used. Click on the folder (for e.g. - emails) from the navigation bar. In the "Instant Search box" enter the related keywords. All the emails with that particular keyword will be displayed in the Outlook panel. 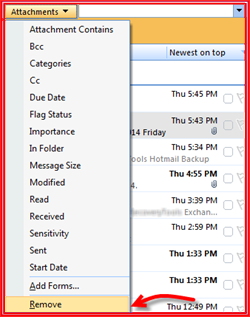 Click on any folder in Outlook mailbox. In the "Instant Search" pane, enter appropriate keywords. Related email messages will appear in the right panel. 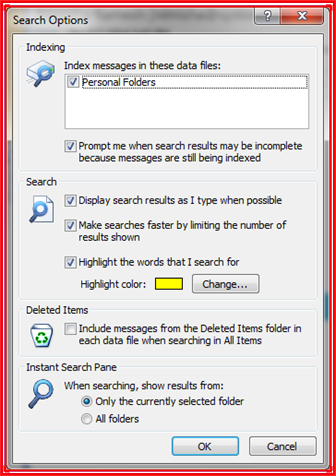 Instant search feature of Microsoft Outlook runs on Windows search components. If it is not installed when you open an Outlook 2007, then a download Windows Search Software will prompt up in front of you. 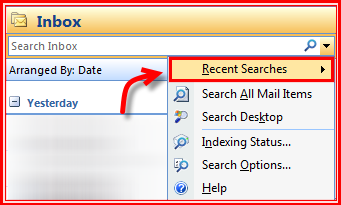 To turn on Instant Search of Microsoft Outlook, click enable Instant Search in Search pane. If you don't found this message, then Instant Search is turned on. On the "Tools" menu, click on "Instant Search" then "Search Options"
Clearing check boxes will turn off the search functionality but not remove Instant search pane. Even after turning off the instant search, you can still do a query in Outlook search, although functionality and performance will be reduced. 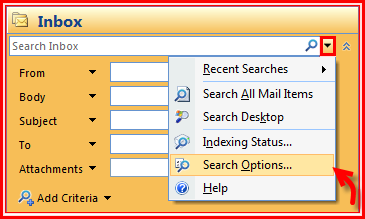 Instant Search box doesn't appear if you run Windows Vista or if the system has necessary Windows Search components. Before enabling Instant Search in Outlook 2010, Windows search 4.0 or later versions should be installed on your system. If it is not installed, then you are prompted to download software. Windows 7: Windows Search 4.0 is by default turned on but if you are not using Instant search then might be the Windows search is turned off. So to enable or disable it follow the given path go to the Control panel, click on Programs, then features, after that set Windows features according to the need. Select Windows Search box. Click on "File" tab and after that "Options"
Clearing check boxes will disable the search functionality, but not remove Instant Search pane. The text below the Instant Search pane "click here to enable Instant Search" will help you in enabling Instant Search. MS Outlook search feature is helpful if you need to refine the search keywords or criteria so that it would more likely match the relevant component. Click on the button available with instant search box. Click on "Add Criteria" and select an option from the drop down list. By selecting an option, it will get added to the search criteria. For removing any option from search criteria, click on the button corresponding to that option and select "Remove". Click on the "Instant Search" pane and the "Search" panel will open automatically. Go through the "Refine" option to filter the search criterion. This feature enables saving time if the user has to search again for a particular item that has been searched in a recent past. By using "Recent Search" option all the search results can be browsed within the panel. Click on the button available with "Instant Search" box. Select "Recent Search" from the list of features. Click in the "Instant Search" box, it will open the "Search" tab. Click on the "Recent Search" tab from the "Search" panel. Search from the list of most recent keywords. Note: It auto saves maximum of 10 records from the most recently browsed search keywords.There are other features as well that can be used to manage and arrange Outlook search measures. These options are defined in the upcoming section. Click on enhance button available with "Instant Search" box. Select "Search Options" from the drop down list. Set overall search criterion such as the number of results to be displayed in the panel. Apply setting to the "Instant Search" pane related to folders. Apply or change the color in which the search results is been highlighted. At last, it can be concluded that the Outlook 'Instant Search' feature is helpful to a greater extent, especially when there is a large number of emails incorporated into an inbox, sent items, outbox or any other email folders. 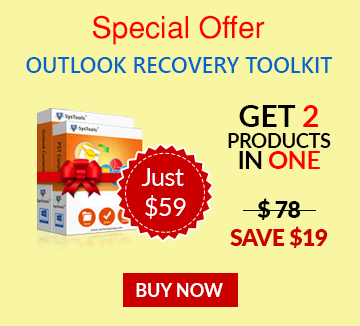 It is applicable for all other components of Outlook mailbox such as calendars, contacts, etc. and helps saving user's time by preventing long and time consuming procedure of random search for a particular item.